Every Prophet has had a Legatee (wasi) in whom the Light of the Imamate has been firmly set and established with surety, and to whom the knowledge of prophecy has been temporarily entrusted through trusteeship. This article illustrates how the historical successor of Jesus of Nazareth, the Messiah of the Children of Israel, was his brother James the Just (Hebrew: Yaakov Tzadik). The evidence for this is drawn from historical sources, including the New Testament, Church Histories, and extra-biblical writings. These sources clearly show that James was the Bishop of the Jerusalem Church, which held authority over the early Jewish Christian communities, and also indicate that Jesus himself appointed James to succeed him. We also explain the theological importance of the succession of James the Just and his family within the Ismaili Muslim theological vision of the hiero-history of Prophethood and Imamat. In Ismaili terminology, James the Just was Jesus’ Legatee (wasi) and the Imam after him. According to the Ismaili conception of the spiritual history of humankind, there have been six Major Prophets – called Natiqs – since the beginning of the current 7,000 year Prophetic Cycle: Adam, Noah, Abraham, Moses, Jesus, and Muhammad. They are the “six days” in which God created the heavens and the earth of the World of Religion. Adam was not the first human being, but his period marked the beginning of the Cycle of Veiling (dawr al-satr) in which spiritual truths (haqa’iq) and esoteric knowledge is veiled by exoteric symbols (zahir) and religious law (shari‘ah). Each Major Prophet brought a divinely-revealed guidance (tanzil) – such as the Torah, Gospel, Qur’an – and a religious law. Every Major Prophet was also succeeded by a Legatee (wasi) from his own family; this Legatee disclosed the spiritual interpretation (ta’wil) of the revealed message and the religious law to the elite of the community. The Legatee was succeeded by a line of Imams from his family and descendants, who interpreted the exoteric and esoteric teachings of the Prophet until the coming of the next major Prophet. The Seventh Natiq will be the Lord of the Resurrection (qa’im al-qiyamah), who will unveil the spiritual meaning of all prophetic revelations and laws at the end of Muhammad’s era and begin the Seventh Cycle, the Cycle of Resurrection. Some of the names of the past Legatees can be determined using the Bible and the Qur’an: the Legatee of Adam was his son Seth; the Legatee of Noah was his son Shem; the Legatee of Moses was his brother Aaron; the Legatee of Muhammad was his cousin ‘Ali b. Abi Talib. In all cases, the Legatee comes from the family of the Major Prophet. Ismaili writings explain how, after Prophet Abraham, the offices of Prophethood and Imamat continued in the separate lineages of his two sons – Isaac and Ishmael. The Prophethood and the Trustee Imamat (al-imamah al-mustawda) were entrusted to Isaac and his descendants. 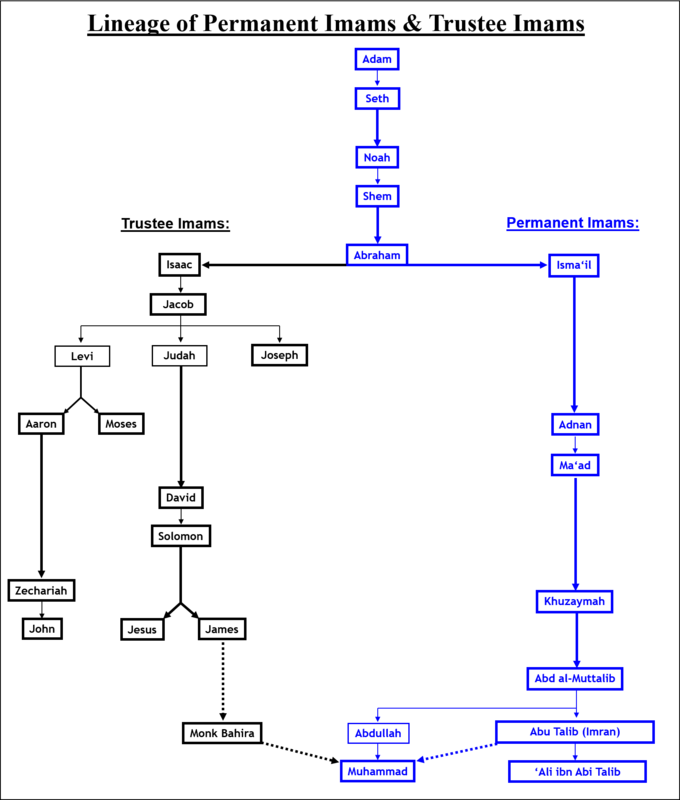 The Trustee Imamat continued among members of the same family as transmitted through brothers, cousins, or progeny. The Trustee Imams after Isaac included: Jacob, Joseph, Jethro, Moses, Aaron, Joshua, the Israelite Judges and Aaronic High Priests, Samuel, David, Solomon, the righteous Davidic Kings and the Prophets of Israel and Judah (i.e. Ahija, Elijah, Elisha, Micah, Amos, Hosea, Isaiah, Joel, Habakuk, Jeremiah, Daniel, Ezekiel, Haggiah, Zechariah, Ezra, Nehemiah, Malachi). Meanwhile, the Permanent Imamat (al-imamah al-mustaqarr) continued with Ishmael and his progeny through an uninterrupted lineal descent down to Imam ‘Abd al-Muttalib, the grandfather of both Prophet Muhammad and Imam ‘Ali b. Abi Talib. During this time, the Trustee Imams stood at the forefront of the Abrahamic Religion in biblical Israel while the Permanent Imams remained concealed in Arabia and unknown to most except the highest ranks of the believers. Jesus was the fifth Major Prophet of the current Prophetic Cycle and symbolically corresponds to the fifth day of the “Great Week of Religion” in Ismaili terminology. The Trustee Imam before the birth of Jesus was ‘Imran, the “spiritual father” of Maryam. ‘Imran designated Zechariah, the father of John the Baptist, to succeed to the Imamat and the spiritual care of Maryam was given to Zechariah. Zechariah knew that Jesus would be the next Major Prophet, so he appointed Maryam as his Hujjah (proof or deputy) to serve as Jesus’ “spiritual mother”, meaning it was Maryam’s role to spiritually train Jesus into the Summons of Truth. In the realm of the esoteric, the Imam and his Hujjah are the “spiritual parents” of every initiate. The Qur’an (3:37) relates that Zechariah would go and see Maryam in her chambers only to find that she was already given food by her Lord. This means that Maryam was receiving divine support (ta’yid) from the Permanent Imam, Khuzaymah, who was in Arabia without the mediation of the Trustee Imam Zechariah. When it was time for Jesus to be initiated into the Religion of Truth, the Permanent Imam sent his divine support – what the Qur’an calls the Spirit (al-ruh) and the Angels – to Maryam and informed her that Jesus, the fifth Major Prophet, was to be spiritually trained by her without the assistance of the Trustee Imam. Her statement, “How shall I have a son, seeing that no man has touched me” (Qur’an 19:20), means that Maryam was not authorized by the Trustee Imam to initiate Jesus into spiritual knowledge. Under normal conditions, Jesus’ “spiritual father” would be Imam Zechariah and his “spiritual mother” would be Maryam. However, in this case, only Maryam would be Jesus’ “spiritual mother” without the aid or consent of Imam Zechariah. The meaning of the “Virgin Birth” – Jesus having been born “without a father” – is that Jesus’ spiritual “birth” took place under his spiritual mother Maryam without the involvement of his “spiritual father” Imam Zechariah. Instead, Maryam received spiritual nourishment or divine support (ta’yid) directly from the Permanent Imam Khuzaymah, who was concealed in Arabia. Zechariah bequeathed the Trustee Imamat to his son John the Baptist, who was also a Prophet and the messianic forerunner of Jesus. John came from the priestly lineage of Aaron and fulfilled the prophecy of the “Messiah of Aaron” (the Priestly Messiah) or the return of Prophet Elijah expected by many Jews in the Second Temple Period. Jesus himself descended from the royal lineage of David and he was the expected “Messiah of Israel” (the Royal Messiah). Before his death, John surrendered the Trustee Imamat to Jesus, whom he recognized as the next Major Prophet at his baptism. In this way, Jesus was the heir to the Prophethood and Trustee Imamat promised to the progeny of Isaac. As documented in our earlier article, both Qur’an and Historical Jesus scholarship agree that Jesus claimed to be and was perceived by his disciples to be a great Prophet of God and the Messiah of Israel and certainly not an “incarnation” of God or a “divine person” within the Godhead. Many New Testament historians refer to the historical Jesus as an “apocalyptic Prophet”. However, Jesus was also revered by the early generations of his followers as an “idealized human figure” – a theomorphic human being who represents God on earth, embodies God’s wisdom and spirit, bears some of God’s names, and carries out many divine functions. The idea that some Prophets represented and reflected God on earth is found in the Hebrew Bible and Jewish writings (see J. R. Daniel Kirk, A Man Attested by God). In the Synoptic Gospels and the pre-Pauline creeds, Jesus is revered as God’s Regent, representative, and self-expression. Thus, from an Ismaili perspective, Jesus was certainly a Prophet of God but he was also the Trustee Imam and was therefore the human manifestation (mazhar) of the Universal Intellect, which constitutes God’s Names and Attributes insofar as they are knowable to His creatures. The earliest group of Jesus followers were Jews consisting of his family members, his apostles, and other followers in Jerusalem. They are often referred to as “Jewish Christians” and differed from other Jews only by their acceptance of Jesus as the Jewish Messiah raised up by God after his death. Otherwise, these Jewish Christians were Torah observant (“zealous” for the Law per Acts 21:20), observed the Sabbath (Acts 1:12), prayed in the Jewish manner (Acts 3:1), continued to attend the Temple and submit sacrifices (Acts 2:46, 3:1), and did not see Jesus’ death on the Cross as a sacrificial atonement for original sin. They interpreted Jesus’ death as a “covenant sacrifice”, similar to the Passover sacrifice, which renewed God’s Covenant with the Children of Israel (as per James D.G. Dunn, “When did the Understanding of Jesus’ Death as an Atoning Sacrifice First Emerge?” in Israel’s God and Rebecca’s Children: Christology and Community in Early Christianity, ed. David B. Capes, April D. DeConick, Helen K. Bond and T. A. Miller, 169-181). Recognition of Jesus as a virtuous human being and Prophet who was “adopted” as the Son of God at his baptism when the Holy Spirit descended upon him; Jesus was the physical child of Joseph and Mary. These early Jewish followers of Jesus constituted the “Jerusalem Church”, which was the “Mother Church” possessing religious authority over all other churches including Gentile believers. The undisputed leader of the Jerusalem Church as indicated by New Testament writings and later sources was James, the brother of Jesus, followed by the Apostles Peter and John. “When we first meet James, the brother of Jesus, in the earliest Christian literature, he is already among the leadership of the Jerusalem church (Gal. 1.19), and very soon thereafter he stands at the head of the community eclipsing even Peter in importance” (Dunn, Unity and Diversity in the New Testament, 262). Thus, James of Jerusalem was the Legatee (wasi) and Imam in direct succession to his brother Jesus of Nazareth. The leadership of James over the early Jewish Christian movement and the Jerusalem Church is indicated in Paul’s Letters, the Book of Acts, the Epistle of James, the Church History of Eusebius (d. 339) (available online) drawing on the writings of Clement (d. 215) and Hegesippus (d. 180) for his information on James. The story of Jesus presenting a “table” to his disciples is also mentioned in the Qur’an as a “Table from Heaven” (5:112). According to the Ismaili Da‘i Abu Hatim al-Razi, the meaning of the “table” that Jesus prepared for his apostles is the divine inspiration (ta’yid) that flows from the Universal Intellect and Universal Soul: “The table means the spiritual sustenance (maddah) from the spiritual stream which they [Jesus’ apostles] were waiting and longing for.” As al-Razi further explained, Jesus bringing the “table from heaven” to his disciples means that Jesus appointed his Legatee or Founder (asas) for the guidance of his followers: “The Messiah intended to install his Founder (asas) and promised that he would appoint the Founder among them so that they would gain the spiritual stream through him” (Translated by Shin Nomoto in his PhD Thesis, “Early Ismaili Thought on Prophecy according to the Kitab al-Islah by Abu Hatim al-Razi,” 1998, 213-214). Thus, the story of Jesus offering a table of bread to his brother James esoterically means that Jesus mediated divine inspiration (ta’yid) to James from the Universal Intellect and appointed James as his Legatee (wasi), in the very same manner that Prophet Muhammad appointed ‘Ali b. Abi Talib as his Legatee. 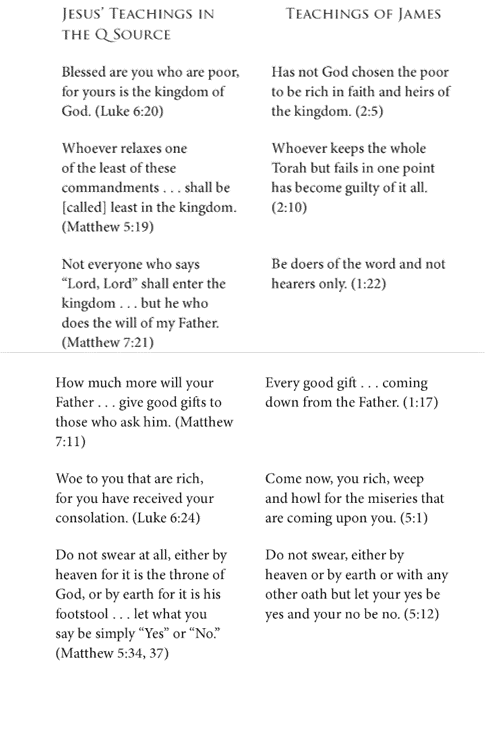 The epistle sent by James to the twelve tribes of the Children of Israel contains his interpretation of the teachings of his brother Jesus. In his capacity as Jesus’ Legatee (wasi) and Founder (asas) of the Imamat after him, James’ essential role was to guide the new community by clarifying the teachings of his brother Jesus. James D. Tabor has traced a great deal of James’ teachings back to the historical teachings of Jesus found in Q, the common source for the Gospels of Matthew and Luke. “The Muslim emphasis on Jesus as messianic prophet and teacher is quite parallel to what we find in the Q source, in the book of James, and in the Didache… Islam insists that neither Jesus nor Mohammad brought a new religion. Both sought to call people back to what might be called “Abrahamic faith.” This is precisely what we find emphasized in the book of James. Like Islam, the book of James, and the teaching of Jesus in Q, emphasize doing the will of God as a demonstration of one’s faith. Also, the dietary laws of Islam, as quoted in the Qur’an, echo the teachings of James in Acts 15 almost word for word: “Abstain from swineflesh, blood, things offered to idols, and carrion” (Qur’an 2:172). Therefore, the appointment of Simon to the “Petrine Office” revered by Catholics amounts to an office of minister or vizier, while the actual successor was James. This means Peter served as the chief minister of James after the death of Jesus and this is what one finds in the New Testament: James stays and rules from Jerusalem while Peter is the leading missionary over the various travelling missionaries. 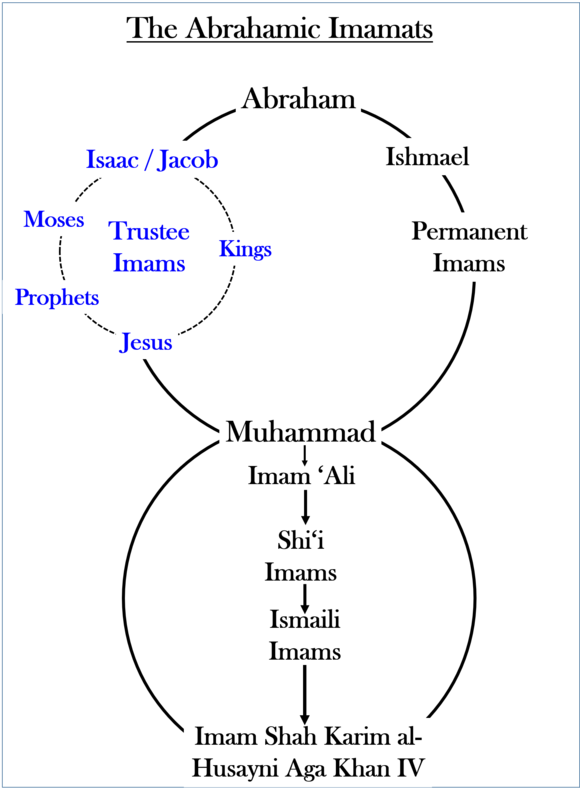 In Ismaili terminology, Jesus was both the Major Prophet (natiq) and the Trustee Imam from the lineage of David. Jesus appointed his brother James as his Legatee (wasi) to succeed to the Imamat symbolized by Davidic royal authority and appointed Peter as his Bab (Gate) or supreme Hujjah (Proof) – meaning that Peter led the preachers (da‘is). Thus, James was the Imam after Jesus while Peter functioned as the Bab or Hujjah of James. The teachings of James directly conflict with those of Paul (Saul) of Tarsus, to whom most of the New Testament documents are attributed to. While James was the appointed successor of Jesus and acknowledged as such by Jesus’ Apostles, Paul presented his authority and teachings as wholly independent of James, the Apostles and the Jerusalem Church. Throughout his letters, Paul refers to “my gospel” as something different from “other gospels” preached by the Apostles of Jesus. “Then after fourteen years, I went up again to Jerusalem, this time with Barnabas. I took Titus along also. I went in response to a revelation and, meeting privately with those esteemed as leaders [James, Peter, John], I presented to them the gospel that I preach among the Gentiles. I wanted to be sure I was not running and had not been running my race in vain. Yet not even Titus, who was with me, was compelled to be circumcised, even though he was a Greek. This matter arose because some false brethren had infiltrated our ranks to spy on the freedom we have in Christ Jesus and to make us slaves. We did not give in to them for a moment, so that the truth of the gospel might be preserved for you. As for those who were held in high esteem [James, Peter, John] – whatever they were makes no difference to me; God does not show favoritism – they added nothing to my message. James the Just was revered as a holy and righteous man by many Jews in Jerusalem. The Pharisees urged James to publicly denounce his faith in Jesus as the Messiah of Israel. However, James refused and instead declared that Jesus was the Son of Man, sitting at the right hand of God in heaven. He was killed by a mob of Jewish leaders in 62 AD. James was succeeded as the Bishop of the Jerusalem Church and the leader of the Jewish Christians by his brother (or cousin) Symeon bar Clopas (Simon bar Cleophas). The basis for Simon’s succession was his familial relationship to James and Jesus. Eusebius calls him a cousin of Jesus but the Gospels (Matthew 13:55, Mark 6:3) suggest he was one of Jesus’ brothers. In Ismaili terms, this means that Simon bar Cleophas became the Trustee Imam after James. The city of Jerusalem fell to the Romans in 70 AD and the Temple was destroyed. It is reported that the Jerusalem leadership fled to Pella under Symeon’s leadership. Afterward, they returned to Jerusalem and the family of Jesus was persecuted due to their being descendants of David and relatives of Jesus. Symeon bar Clopas was accused of heresy, tortured, and finally killed in 107 AD. Symeon was succeeded as the head of the Jerusalem Jewish-Christian community by another member of Jesus family, named Justus or Judas. “It is reported that after the age of Nero and Domitian, under the emperor whose times we are now recording, a persecution was stirred up against us in certain cities in consequence of a popular uprising. In this persecution we have understood that Symeon, the son of Clopas, who, as we have shown, was the second bishop of the church of Jerusalem, suffered martyrdom. Hegesippus, whose words we have already quoted in various places, is a witness to this fact also. Speaking of certain heretics he adds that Symeon was accused by them at this time; and since it was clear that he was a Christian, he was tortured in various ways for many days, and astonished even the judge himself and his attendants in the highest degree, and finally he suffered a death similar to that of our Lord. But there is nothing like hearing the historian himself, who writes as follows: Certain of these heretics brought accusation against Symeon, the son of Clopas, on the ground that he was a descendant of David and a Christian; and thus he suffered martyrdom, at the age of one hundred and twenty years, while Trajan was emperor and Atticus governor. Eusebius provided a list of the successors of James the Just to the office of Bishop of Jerusalem. He noted that all these Bishops were circumcised Jews, which means they adhered to the Torah of Moses. He also said that that these Bishops “received the knowledge of Christ in purity”, meaning that they preserved the true teaching of Jesus. From an Ismaili perspective, these Jerusalem Bishops were the Trustee Imams and the legitimate successor of Jesus. While the above list of fifteen persons is presented by Eusebius as a line of successors to James, Richard Bauckham has argued that only James, Symeon, and Justas (Judas) were the Bishops of Jerusalem in succession while the other names refer to twelve deputies serving under them. “These can then by readily understood as a college of twelve elders who presided over the Jerusalem church along with James… there is evidence, especially in the Jewish Christian traditions incorporated in the Pseudo-Clementines, for the idea that a monarchical bishop should have twelve presbyters” (Bauckham, 73). According to Bauckham’s reading of Eusebius, Symeon was the Jerusalem Bishop for some forty years and his successor, Justus (d. 113), was the son of James or Jude, another of Jesus’ brothers. In any case, all the successors of James came from the descendants of Jesus’ brothers, including James himself and Jude. From the extant evidence, it appears that the descendants of Jude, recognized as Desposynoi and Davidic descendants, exercised leadership roles in Palestinian Christianity well into the second century. In Ismaili terms, this means that the progeny of Jesus’ brothers, James and Jude, succeeded as Trustee Imams preserving the essence of Jesus’ revelation and teachings. The twelve deputies under the Jerusalem Bishop refer to the twelve Hujjas of the day who convey the Imam’s teachings. According to various Ismaili sources, including the writings of Ja‘far b. Mansur al-Yaman (the Bab of the Imam al-Mu‘izz and second to the Imam in spiritual rank), the Trustee Imam from the successors of Jesus immediately before Prophet Muhammad was the Monk Bahira of Syria. This means that the Trustee Imamat of James was transmitted through the descendants of Jesus’ family until it reached Syrian Monk Bahira, known as Georges, the last Trustee Imam in the Cycle of Jesus and the remnant from Jesus’ family who carried on his true teachings. Ismaili writings inform us the Permanent Imamat was handed down from Ishmael, in direct lineal descent, to Imam ‘Abd al-Muttalib (the Prophet’s grandfather) and Imam Abu Talib (the Prophet’s uncle and father of Imam ‘Ali). The Trustee Imamat was held by Bahira as the legitimate successor to the prophetic heritage of Jesus and James. There is a famous account in both Sunni and Shia sources where Abu Talib and Muhammad met the Monk Bahira while on a business trip to Syria, and Bahira recognizes Muhammad as the future Prophet. This meeting represented the climactic confluence of the Israelite Imamat held by Bahira with the Ishmaelite Imamat held by Imam Abu Talib. Prophet Muhammad began his mission in Mecca as a “warner” and “conveyer of news” – as a Messenger of God without the rank of Imamat. Upon the death of Imam Abu Talib, Muhammad was appointed as the Trustee Imam and Monk Bahira surrendered the Imamat to him. Shortly after, Muhammad and his community emigrated to Medina, where Muhammad formally began functioning as the Trustee Imam, embodying both the Ishmaelite and Israelite religious legacies. It is important to observe that the actual roles performed by Muhammad in Medina (as reflected in the Qur’an) greatly resemble the office of the Bishop in the Christian Episcopate. This is entirely expected because Muhammad inherited the Imamat of James the brother of Jesus from Bahira and James’ leadership office was the source for all the Christian episcopates. The similarities between the teachings of James the Just and the Ebionite Jewish Christianity that traces its origins to James have been noted by several scholars, including Robert Eisenman and James Tabor. Similarly, there is strong correlation between the notion of James succeeding Jesus due to being his family member and being directly appointed by Jesus and the spiritual rights of Imam ‘Ali as the closest male relative of Prophet Muhammad and being designated by him. With salaat and salam for Imam e Zamana, I am sharing the name of the Karta of Vasudhaiv kutumbkum saluted in Darood Shareef with all in 7.5 billion commune/kunba/kumbh/sangha of Adam SUH, the first Muslim Khalifatullah. https://www.straight.com/news/1069616/jagdeesh-mann-aga-khan-brought-prosperity-his-faithful-and-now-looks-uplift-worlds is the great news, I have shared at FBSeeking prayers for me for my time in speaking about the Imam e Zamana. In Haji Bibi Case Bombay 1905 the genealogical chart presented by Imam Sultan Muhammad Shah mentioned Simon Peter (Shama’un) as Imam in the time of Jesus Christ, where as your article mentions James as Imam of that time. My question is; Was that Simon Peter or James? Do we believe in affidavit produced by Imam or your article? Need clarification. Thank you very much for this article. I read it over my lunch breaks this week. It was extremely interesting and satisfying. For the last year or so I had been wondering, in the back of my mind, what happened to the progeny of Jesus. What was happening during the time after Prophet Jesus until Prophet Muhammad, and the sequence of Imamat in between this time. This article answered my questions. Thank you. May our most beloved Mawlana Hazar Imam bless you and your families.